For Student Life, I attended the club Spoon University. It’s essentially a food club, where there are photographers, videographers, and writers who look for places for students to eat intelligently. Many colleges have a Spoon University club, and these clubs come together to create a larger community. When they say for students to eat intelligently, they don’t mean for students to eat healthily, but more wise in terms of money and location. I didn’t exactly know whether I would enjoy the club, but I ended up really enjoying myself. Initially, it started off a bit awkwardly since no one knew each other, but we quickly got acquainted as we started off the club with a game. We played Head’s Up, but food edition. Everyone who guessed their food correctly would get a free chips and guac/burrito coupon. I was really nervous going up there because with my luck, I would be the one person who wouldn’t be able to guess their food correctly. However, in the end, everyone guessed their food correctly and got a free coupon. Everyone was very friendly and helped each other guess correctly. It helped me adjust to Baruch life because it made me feel apart of a community. This club showed me the wide range of clubs Baruch has to offer and the different communities I can be apart of. I am thinking about possibly joining the photography and videographer committees. I’m not too well versed in making videos, and this would give me an opportunity to learn and try something new. I’m really excited to possibility pick up a new skill. It also allowed me to socialize with different people that I wouldn’t have met or seen otherwise. To add to this, there was free pizza! 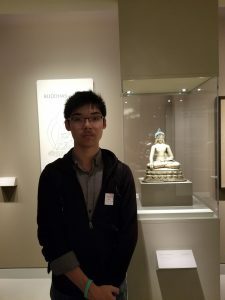 For this time around, I decided to go to the Museum of Modern Art to accompany my friend Fahim for his Freshman Seminar blog post. Shameful to say, I have never been to the MoMa, even though I am a native New Yorker. Everyone I know seems to have visited there but me. Alas, I have finally found the opportunity to go. Luckily, it was free for CUNY students, so I was able to save my money for once. Walking into the first gallery, I was immediately met with a metal sculpture with a face (I was so intrigued in observing it that I actually forgot to look at the description to see what it was and who it was by.) The sculpture seemed extremely lifelike, with the face having the face of what seemed like terror, with its mouth open, giving off the appearance that it was screaming. I walked around and noticed a lot of sculptures made from different inanimate objects, appearing to be animated. It reminded me of when I read an article about Marcel Duchamp’s Bicycle Wheel being displayed at the MoMA. I definitely went and saw Starry Night by Vincent van Gogh. I have always seen pictures of this painting, but I have never seen it in real life, and it was truly spectacular. It made me reminisce about the time I went to the Metropolitan Museum of Art with my cousin last summer and being able to see van Gogh’s Straw Hat Self Portrait. I was astounded by how intricate it was and it made me realize right then and there just how stunning van Gogh’s artwork truly is. Walking around in this museum made me realize how much I have been missing out on. By all means am I not an art fanatic who knows everything about art, rather I appreciate what artwork I do get to see. I do not go to museums every other day, especially art museums, but I really should. Broadening my horizons is what college consists of, and by doing that, I can learn a lot of new things about my city and myself. On October 5th, I attended the second general interest meeting for the American Marketing Association club. It is the only marketing club at Baruch that has a collegiate chapter to an outside business (AMA) with many other collegiate chapters, such as NYU. What initially attracted me to the club was its official sounding name which I found when scrolling through the list of Baruch clubs online. This led me to follow them on Facebook and find out about the GIM. I was really interested in joining a marketing club to network, increase potential job opportunities and to hopefully, make friends. I arrived to the club really early on Thursday to find myself being the only one there. A guy shows up a couple minutes after and I’m relieved as I was starting to worry that the meeting was non-existent. Later, a girl arrives and we’re all talking about how weird it is that no one else was there. When a member from the club shows up and around fifteen more people about twenty minutes after, we meet all the e-board members of the club and start playing an ice breaker game. I found the atmosphere to be really chill and I noticed how outgoing everyone was, as everyone there was a marketing major. The meeting then proceeds to discussing about the benefits of joining the club. They presented the club really well, as one of the members joked about being a marketing major and making sure we’re being persuaded. They encouraged us to join the collegiate chapter, which had a fee but had more benefits and networking opportunities than simply joining the club at Baruch. Since this meeting, I’ve started working on a case study competition with them and plan on joining their marketing committee. I look forward to becoming an e-board member and really expanding the size of the club, as there is a lot of potential in it. On September 8th, I visited a resume revision workshop hosted by the Finance and Economics group. This workshop began with an introduction from the leaders, in which they discussed their interview experiences and gave the people who attended tips. For instance, one tip I received from the introduction was that it is vital to have unique interests on your resume that will make it stand out among others. This can be something that is unrelated to the job, but it makes you a more interesting person; therefore, more likely to be hired. Following the informative introduction, we were able to have the leaders review our sample resumes we brought to the meeting. The resume I brought to the workshop I have used to get two jobs in the past year, so I assumed it did not need a lot of touch ups. However, I was very wrong. When Kevin, one of the leaders, examined my resume, he asked if I am an art major. For a moment I was confused, because I thought that having a creative resume was a positive aspect. My resume had a specific format and had red borders. When I asked why, he explained that in the business field the resumes are supposed to be conservative. Additionally, Kevin explained how to correctly and more effectively explain my experiences, so that it will be relevant for future jobs. Overall, the resume workshop helped me make a better resume. Before the workshop, I was not aware of the awkward phrases on my old resume because I never really looked at other resumes, so seeing more examples and having someone look over mine and give me advice was very helpful. The people there are very bright and informative, which made the whole meeting a good learning opportunity. After the workshop, I modified my resume and now feel more confident about it. For the next blog post, I chose to go to the Metropolitan Museum of Art. In this museum, I got to see many different type of art in various time periods; such as the Greek and Roman art, Egyptian art, Modern and Contemporary art, European Paintings, Asian art, and Arts of Africa, Oceania, and the Americas. I enjoyed looking at the similarities and differences shown in each time period. Going with a friend also made it more enjoyable as we shared opinions and thoughts of each paintings as we walked through the museum. The Met was really big and spacious, I think I spent at least an hour to two in there browsing at every painting and reading their descriptions. I also went to this museum for my art assignment as well which is another reason why I spent a lot of time in the museum since I had to find a painting from four different categories. My favorite time period art is Post Impressionism art, as you can see in the picture above. The art style in this time period really have no set way on drawing something and everything is drawn distinctly and variously. Even though some paintings could look really off and weird, that’s the aspect of Post Impressionism art; it’s different and unique. 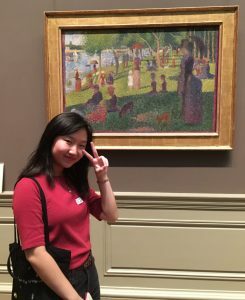 The painting that is in the picture is called A Sunday on La Grande Jatte and within this painting, it looks like a jig-saw puzzle because the colors are separated yet blended together side by side which makes the art stand out compared to the other paintings in this section. 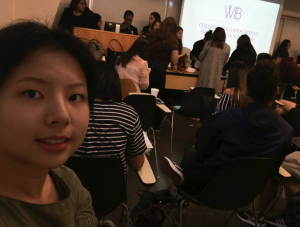 In the second week of school, I went to the first general interest meeting of Women In Business for my freshmen blog. I chose to attend the meeting held by this club because just as its name suggests, it’s for female students that have the interest to pursue careers in the field of business. My intended major is accounting, therefore, I would like to join some clubs that are relevant to business and gain experience starting from the first year of college. I went with a friend who also wanted to major in business. When we entered the room, there were already a lot of people that were the old members of the organization sitting or standing there and socializing with each other. It was a bit awkward for us because since we were new to the school and the clubs in the school, we didn’t really know how to participate in a general interest meeting comfortably like others. Many of the people attended were dressed professionally, which made the atmosphere totally different from what I was used to in high school club meetings. The goal of the club is to help women to be ready to work in the business world by offering mentorship programs and hosting events that can connect them to the professionals. During the meeting, we were introduced to different committees of the club, such as Pearls of Wisdom, Style Your Success, marketing, graphics, mentorship, and corporate relations. To become a member, one can either join a committee or become an inductee. The three key values of this organization are mentorship, which refers to their mentorship program, Athena, mobility, which is the opportunity that they provide to members to climb up the ladder of this organization and become board members, and meritocracy, which is the availability of opportunities to let the members develop leadership skills. I have learned a lot about the club’s structure and purpose after this meeting. Hey Guys! 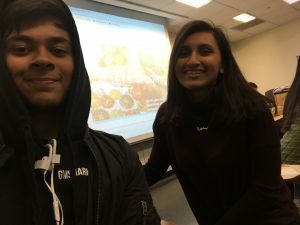 For this blogpost Sameera and I went to the general interest meeting for Spoon University, a club centered around food. Upon arriving we were greeted by the club branches founder, VP, and secretary. When everyone got settled in we played a game of “Guess What”, which is basically putting a card to one’s forehead and guessing what you are, but in the theme of foods. After this ice-breaking game they gave out free Dos Toros gift cards which we could use for either Chips and Guac or a Bowl. Then the founder of the club explained what the club was all about, just a club that loves food, and we were given the opportunity to sign up for the club… Which i didn’t. For my community service project, I decided to visit a favorite volunteering site of mine; The River Fund NY. The River Fund is a government agency/food pantry. From Mondays to Fridays, it served as a government benefits agency, in which individuals are able to submit paperwork for financial needs, such as social security disability (SSD) and so on. However, on the weekends, this location becomes a food pantry. Families who are financially unstable are given food items, ranging from milk, juice, bread, fruits, vegetables, and so on. At 6am, hundreds of people begin lining up for the food pantry, which goes from 7am-11am. Even though things can get very hectic, there’s no better feeling than handing out these food items to families in need. The smile on their faces and gratitude shown make all the work definitely worth it. By 7am, the dozens of River Fund volunteers begin working, as we distribute, organize, and stock the several food items, located at different locations. Since all the food items at the food pantry were donated from other locations, such as Food Bank NYC, its a first come, first served basis. At 10:00 am, the pantry is at full swing, as volunteers are rushing back and forth to ensure everything is smooth. During my most recent visit, I found myself re-stocking the shelves and distributing the food. Even though some clients don’t physically show their appreciation, it’s still a great feeling to help those in needs. In addition, everyone has their own issues, so it isn’t fair to judge one’s appreciation from their expression. By the time 12:00 comes around, the line begins to slow down. At this point, we begin to distribute less of each food items, since we’re trying to cater for all that remain on the line. At 1:00, the clean up of the pantry begins. We begin to fold the tables and tents, throw away any garbage, and sweep the entire pantry. Even though the whole process may seem very routine and boring, my fellow volunteers make the food pantry feel like home. It’s a very relaxed environment, as the founder, Swami Durga Das, emphasizes the need to accept and appreciate all. As a result, I’ve been able to call the River Fund home for the past few years. I’ve also been able to take part in several events, such as our Annual Child Poverty Awareness Day and Annual Gala Event, in which we raise money for scholarships through donations. Also, through the Summer Youth Employment Program (SYEP), I received my first job at the River Fund, in which I worked as part of the government benefits team to help families receive the help they needed. These experiences taught me to appreciate everything in life, as there are others who struggle with much more in their lives. All in all, my memories and experiences through the River Fund are some I’ll never forget. I’ll always appreciate that they were willing to give me, as a 15 year old with no experience, a chance, which is something I’ll appreciate forever.